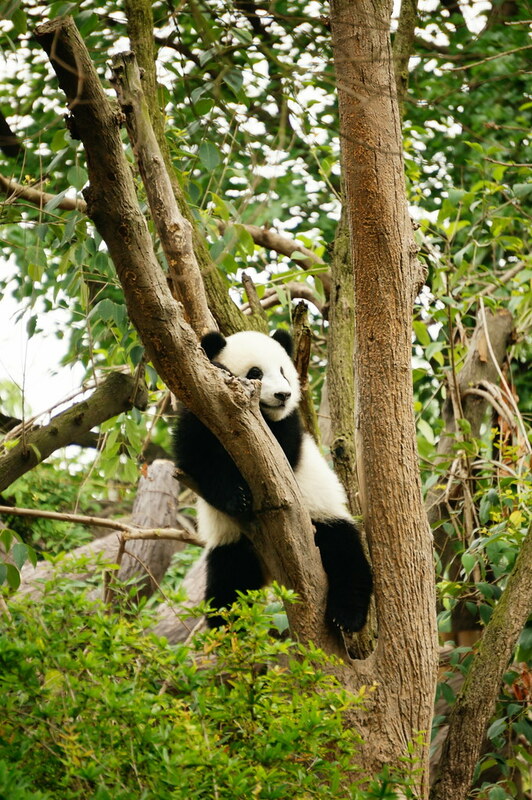 Since our arrival in Chengdu the image of the panda has been everywhere. 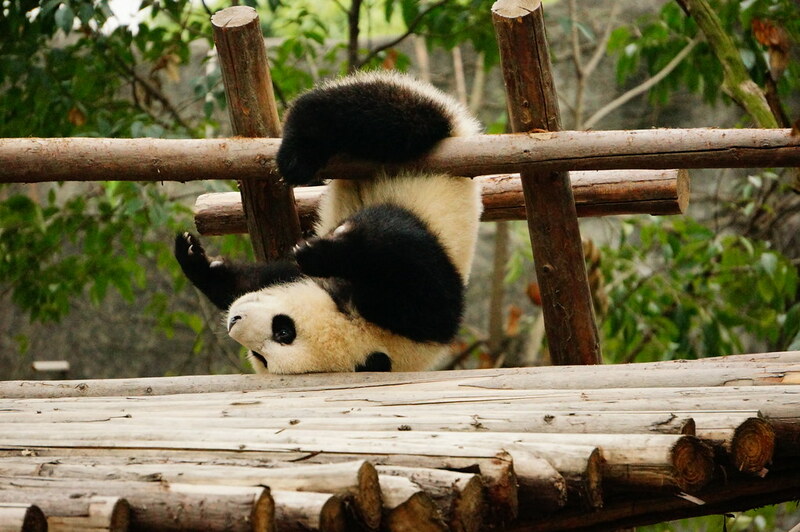 It takes the form of panda bags, magnets, cups and even a giant panda climbing up the nearby shopping plaza windows. 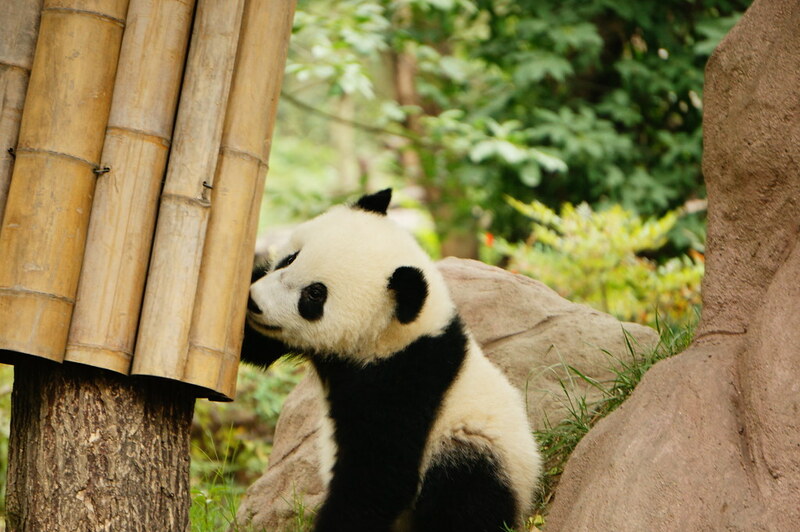 Chengdu is at the heart of world research into pandas both giant and red. 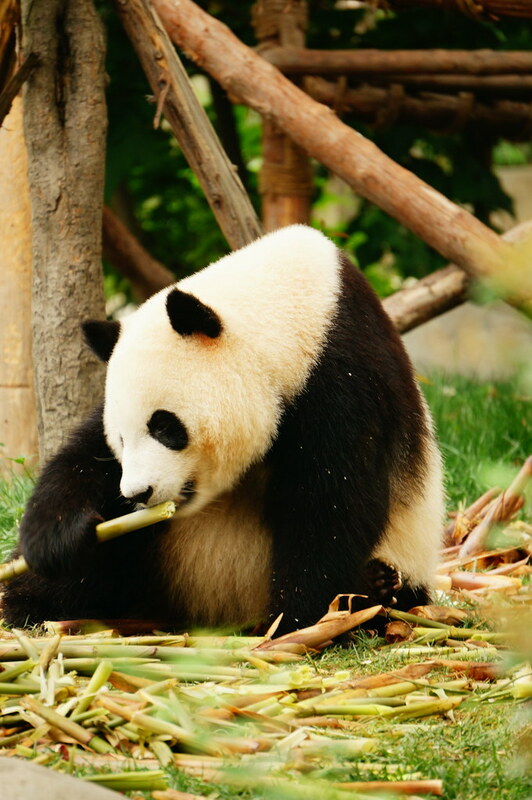 It is also the world leader into artificial insemination of pandas with the aim of trying to successfully breed giant pandas and then in the future prepare them to live in the wild. 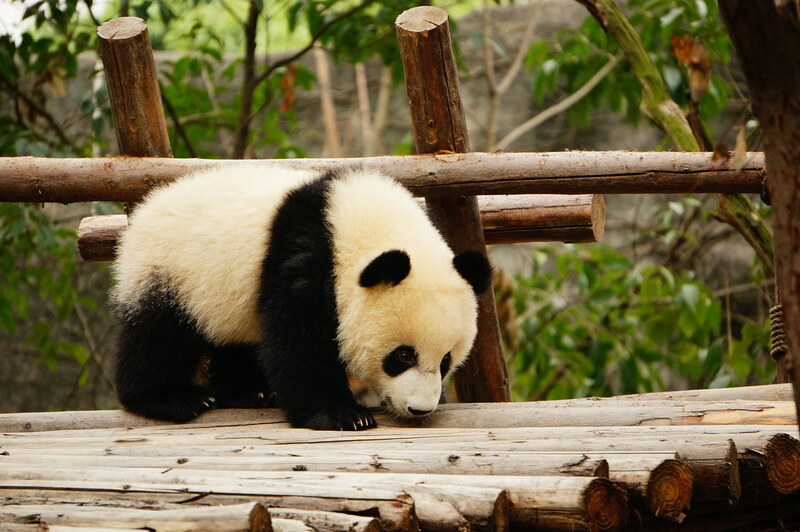 At the last count there was around 1,000 pandas left in the wild in China. 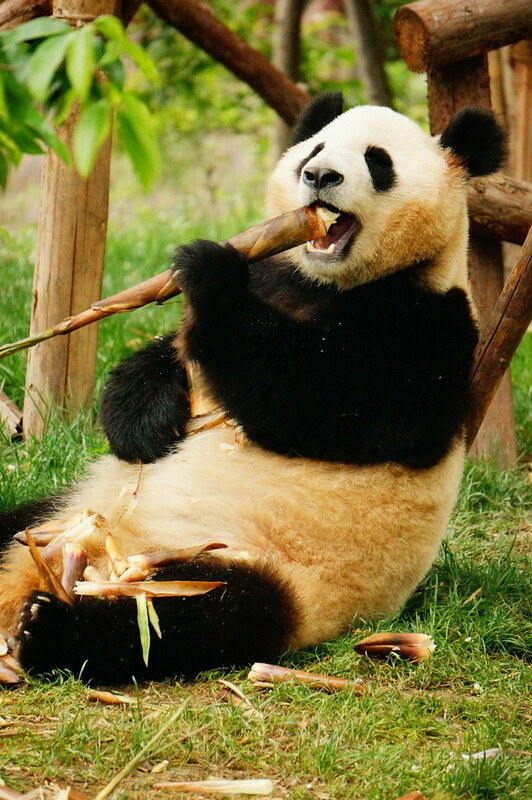 They have been around for 8million years, starting life as carnivores before changing to eat bamboo. 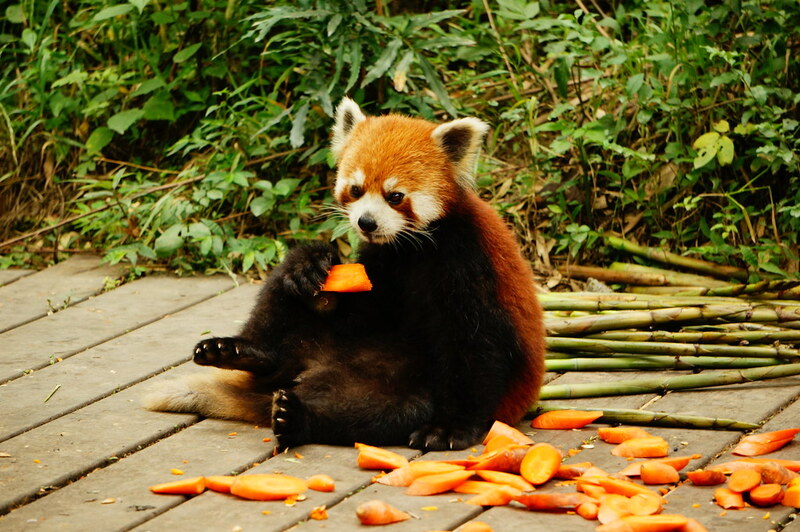 They still have the digestive system of a meat eater and only 20% of the bamboo they eat is actually digested. Everything else is wasted! 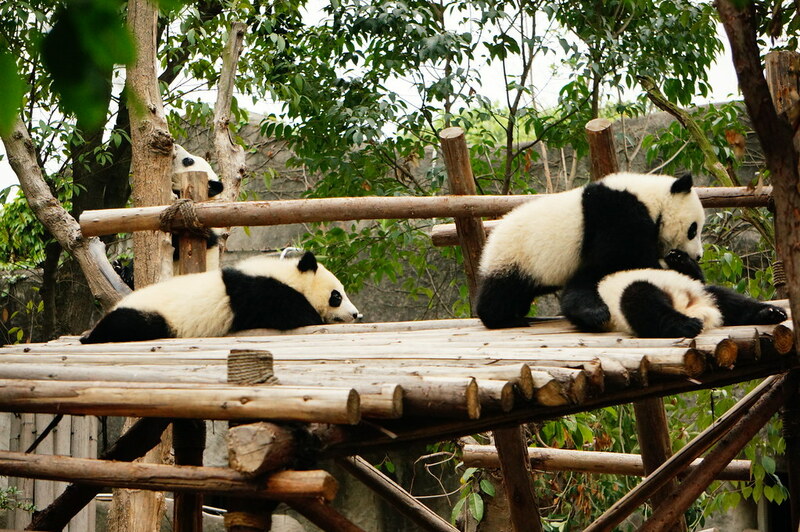 Previously, their habitat was the whole of China. 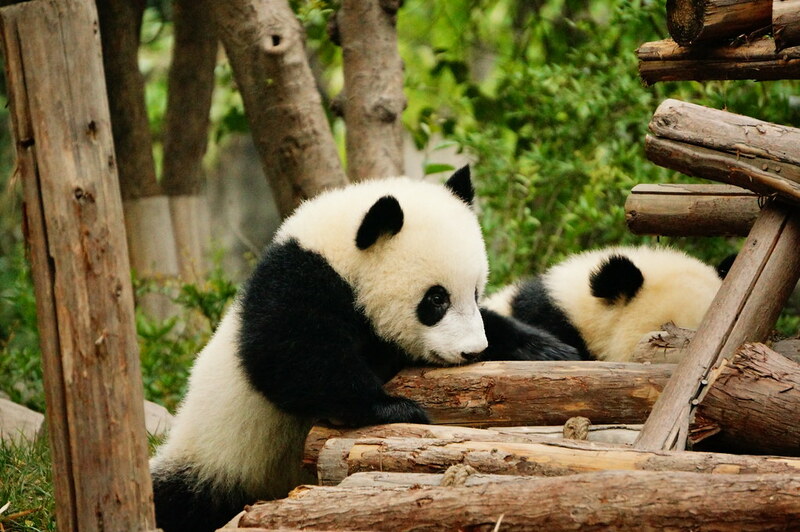 Now they live in small pockets in Western China. 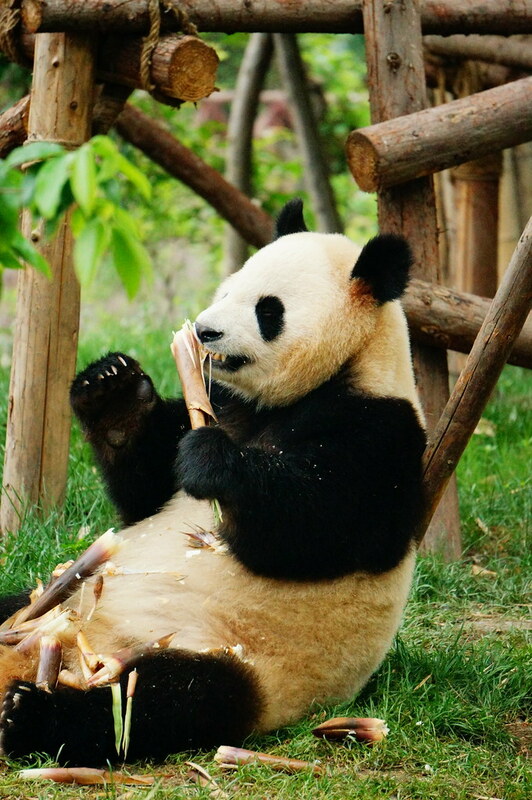 The Chengdu Giant Panda Research Centre is responsible for breeding pandas which have been used a diplomatic tools with some people arguing it is merely a breeding centre with no hope of them being returned to the wild as they cannot fend for themselves. We left at 7.10am and set off to another hostel to pick up someone else. As our driver went in he was passed by a girl who proceeded to have breakfast across the street. 15minutes later the girl went back into the hostel before emerging with the driver 5 minutes later. We were delayed by 20minutes meaning that we missed the start of the ‘tour’. The tour was a man showing us the best bits of the Sanctuary whilst hurrying us along. He spoke no English. 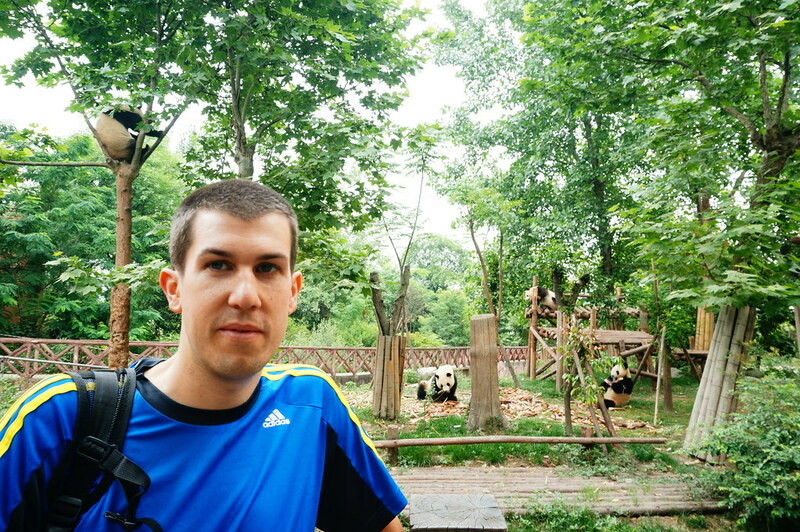 We eventually arrived at the Sanctuary at 8.15am and our driver swiftly took us to the other end of the park for our first glimpse of the Giant Pandas. The first ones we saw were a mother and her young cub before moving onto the youngsters tumbling around and climbing trees in their habitat. 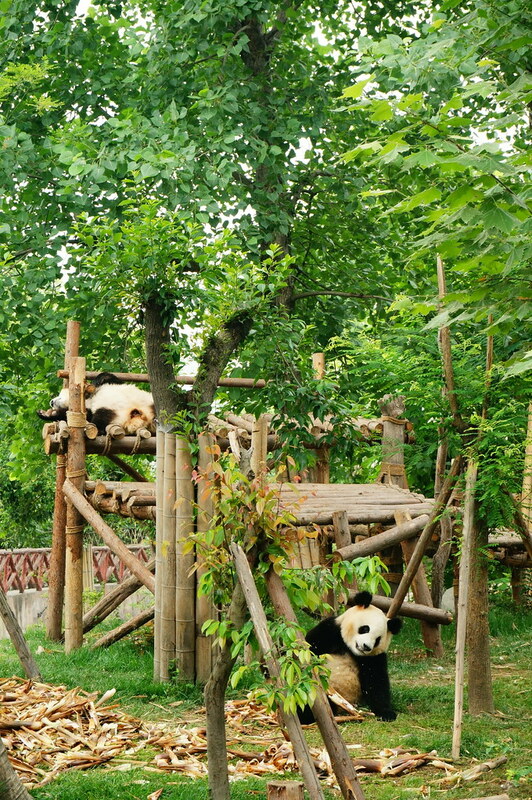 The Sanctuary is very clean and it appeared that the pandas had lots of space to play and relax. 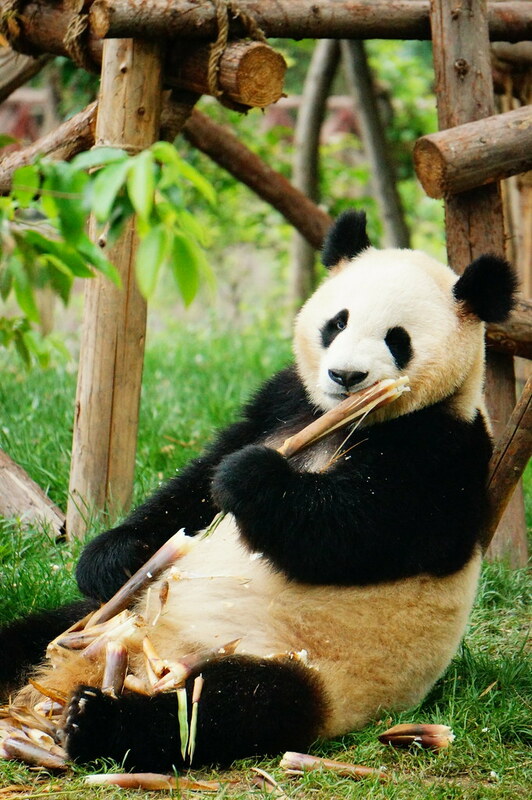 Our next enclosure had a group of pandas eating their breakfast. 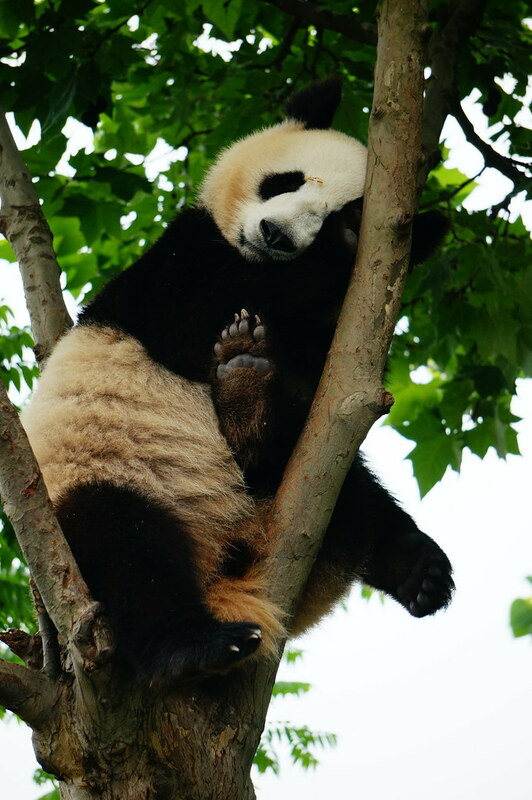 One wasn’t interested and promptly climbed a tree to sleep. 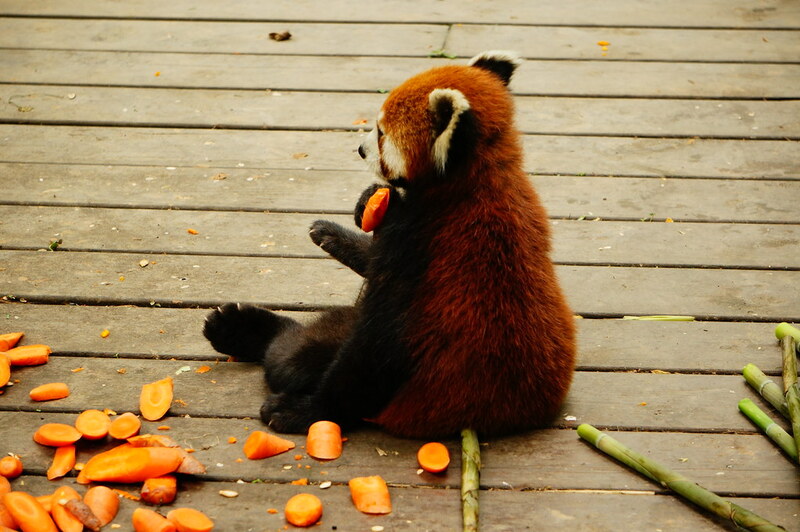 This panda on the other hand was clearly enjoying his food. 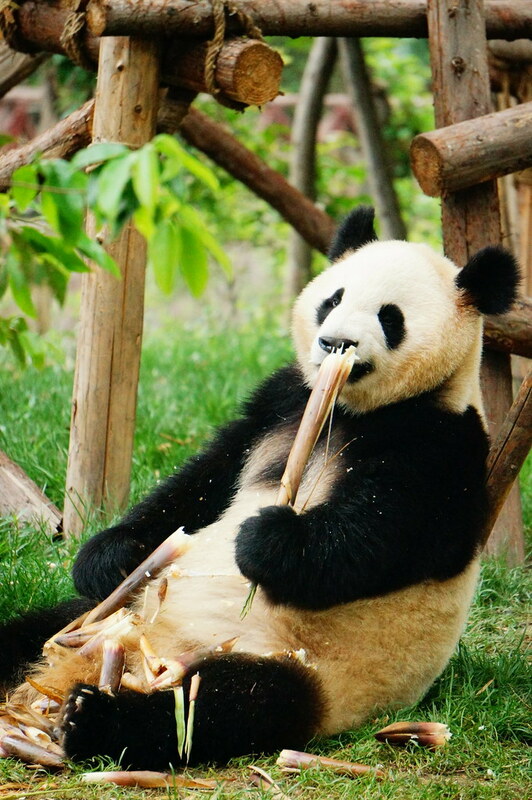 As pandas are inefficient, retaining only 20% of the energy given by the bamboo it is not surprising that they just sit around or lie down. 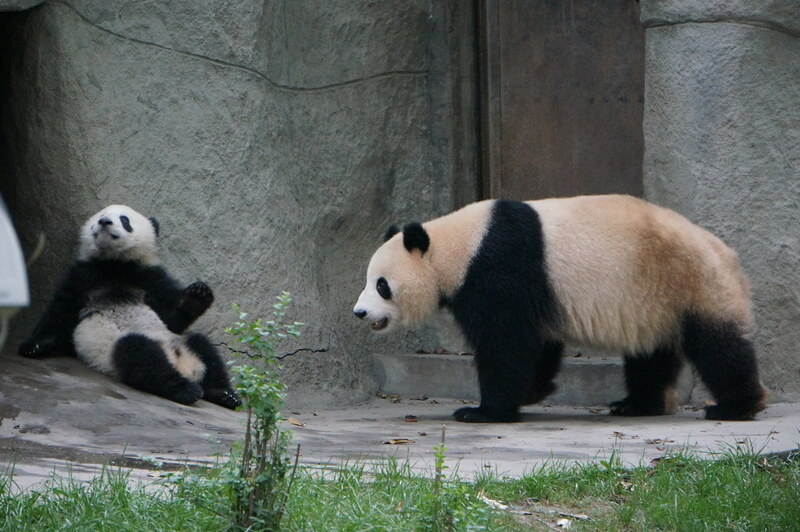 However, the younger pandas are a lot more active and seem to enjoy rolling and tumbling or play fighting with their mates. 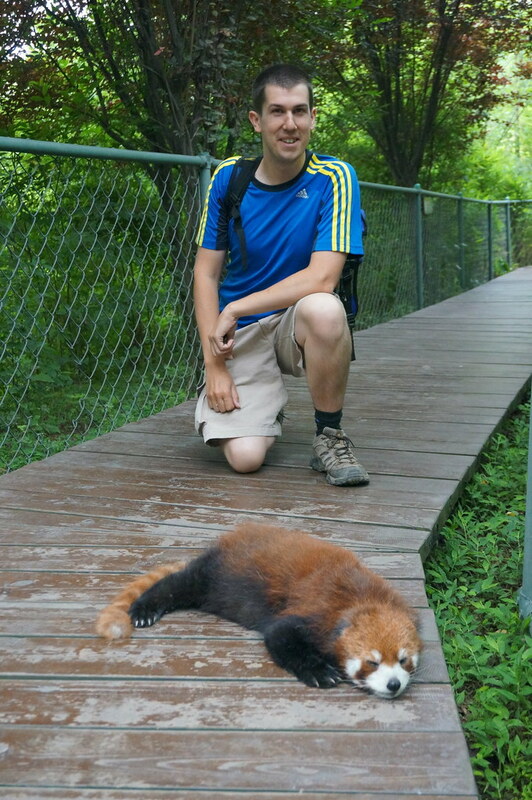 We then went to visit the Red Panda which is not actually a panda. 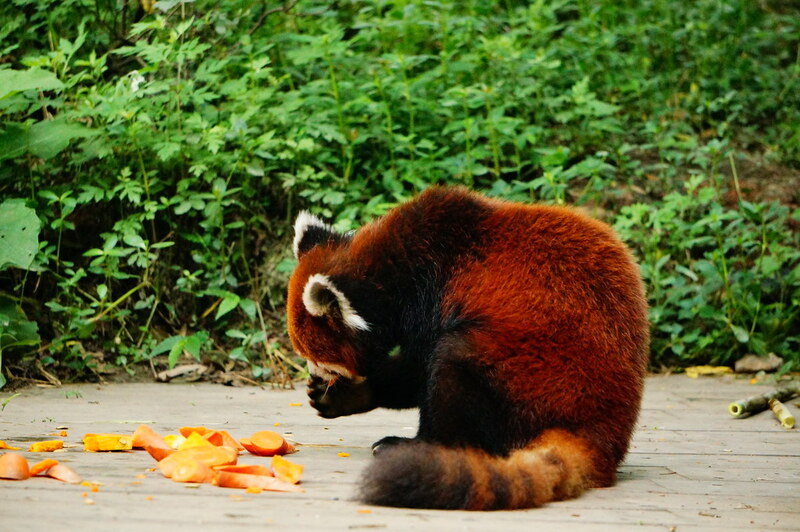 When trekking in Nepal we had been told that wild red pandas lived in the Himalayas but had not been lucky to see any. 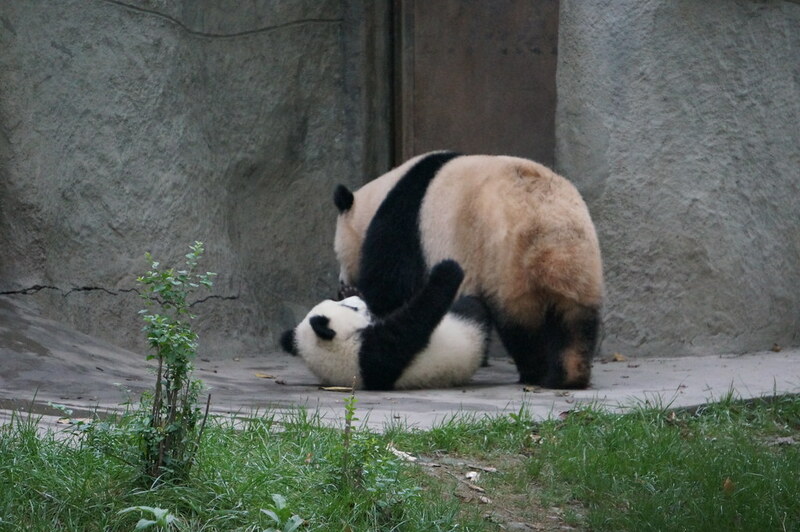 I had seen some before in a zoo but never up close. 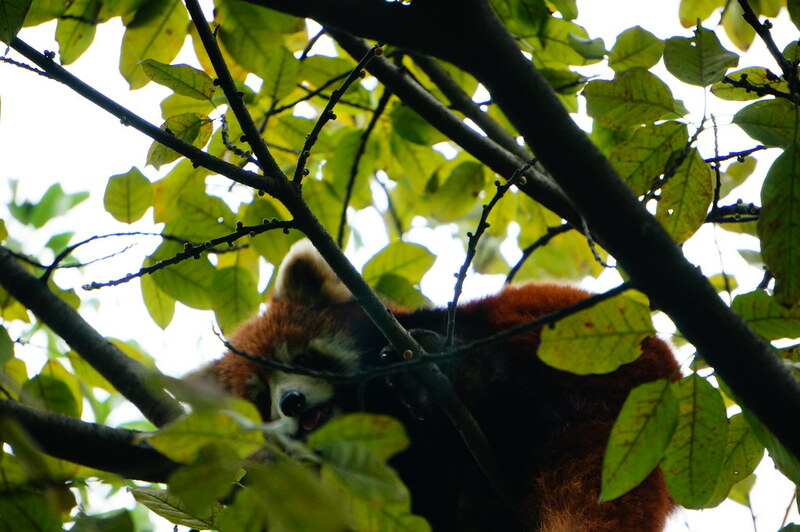 As soon as we entered the enclosure we spotted one up a tree. I think they look more like racoons than bears. 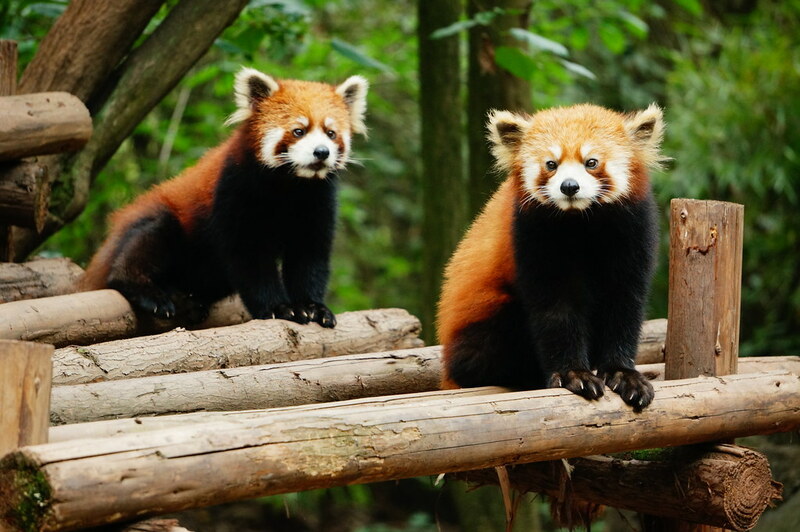 They are indeed cousins of one another just like the giant panda is a cousin of the red panda. 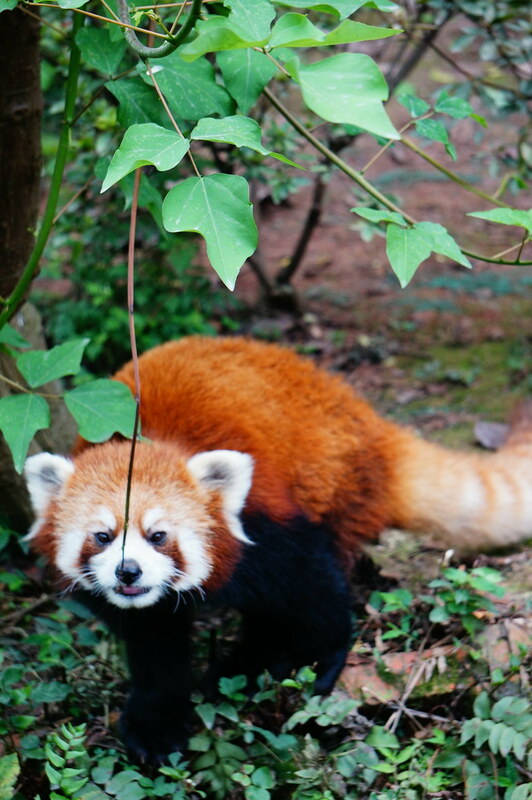 Then we wandered further to be met by a thirsty red Panda who wandered across the path about 15cm from us to get a drink. 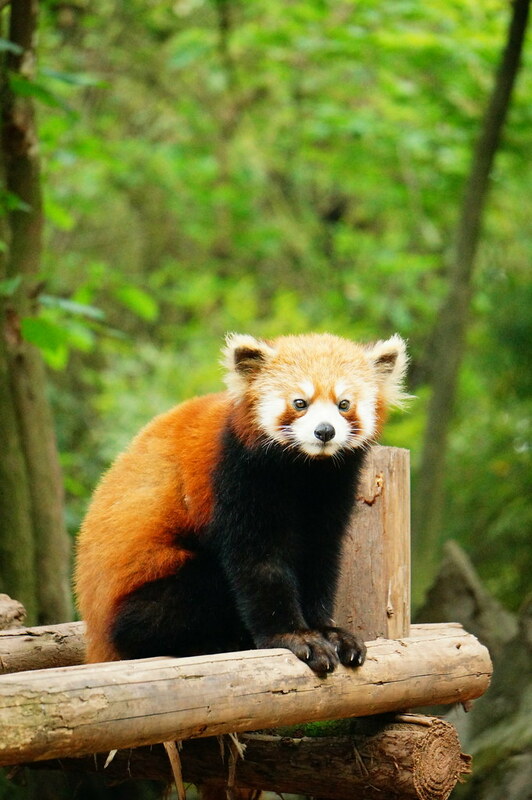 The colour of its fur is a fantastic mix of dark reds, orange, auburn and brown. 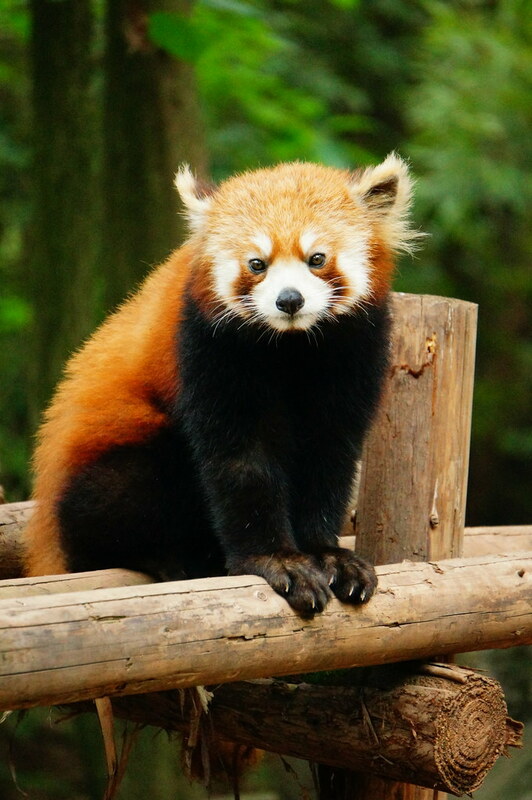 It looks like a mischievous teddy bear that wants to bite your head off. Signs warned us not to follow them as they can get aggressive. 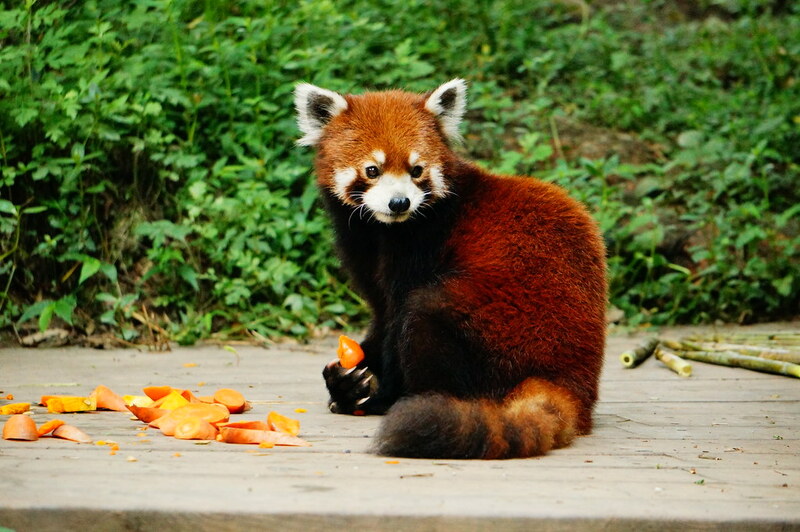 This one seemed more interested in its sweet potato but happilly posed. 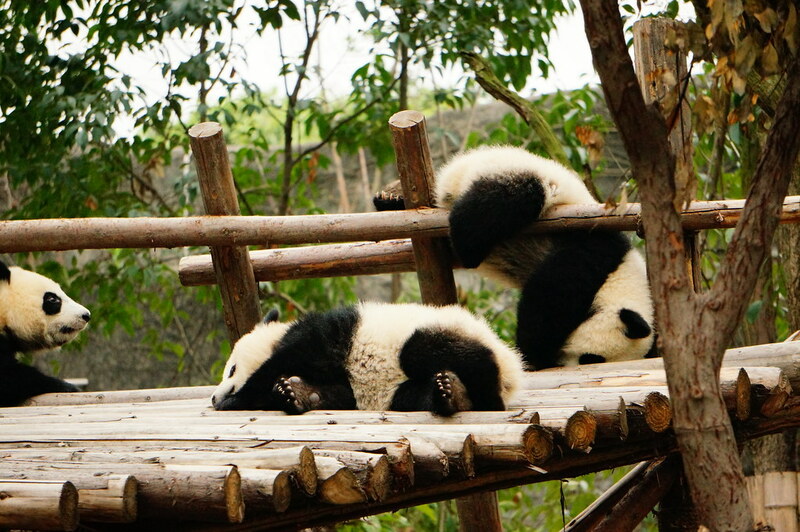 On our way out we spotted a panda just lying on the boardwalk. I checked to make sure it was breathing, as despite being surrounded by 12people it didn’t move. Cue photo opportunity. 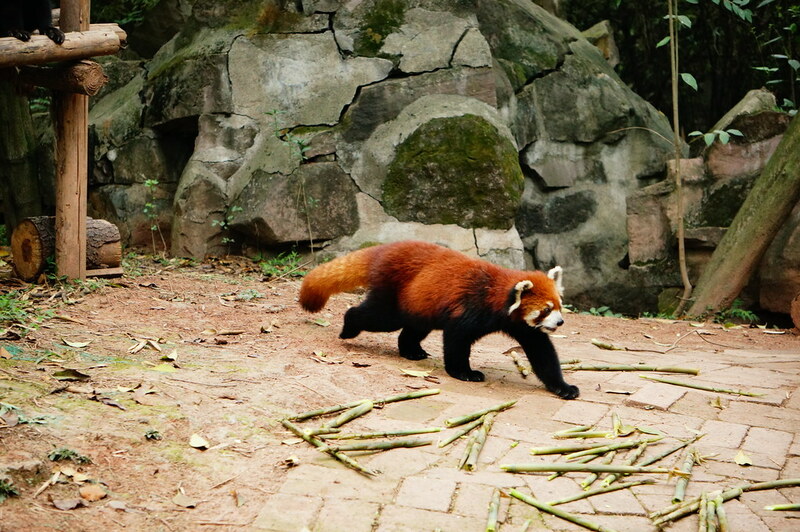 We then went to see some fluffier red pandas. 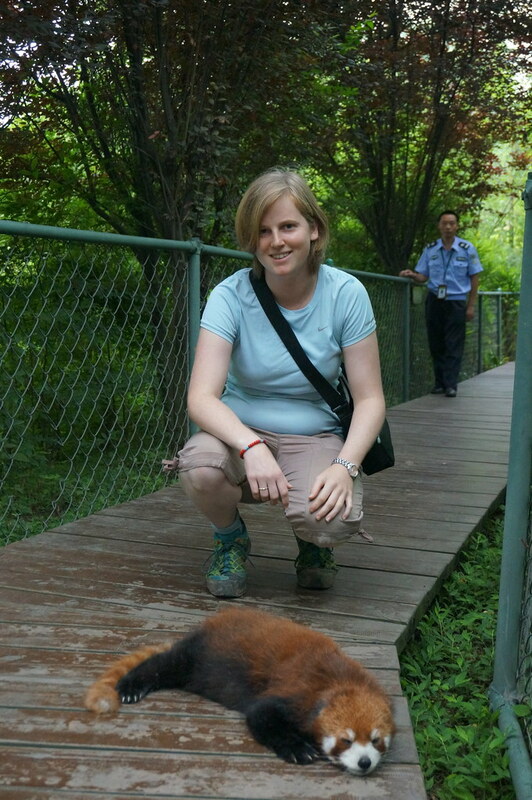 This was an excellent morning because the pandas appear to be well treated and you can get close to them. 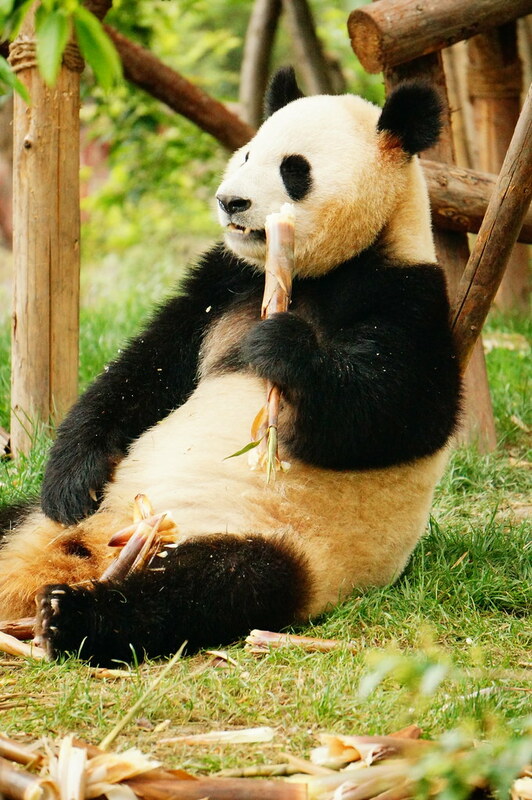 You are around 3m away and there are no mesh wires around the enclosures. 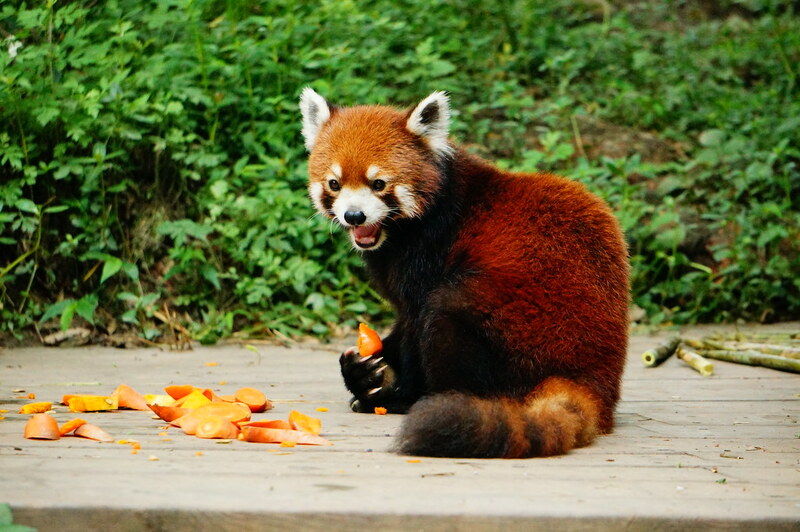 Yes, it is another form of zoo but at least something is being done to prevent their extinction and they seemed pretty happy rolling around and eating their food. 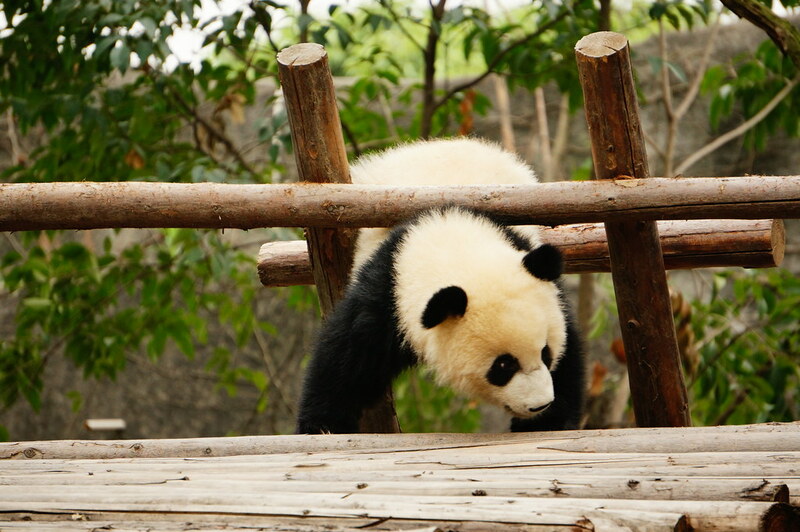 All our photos from the panda sanctuary can be seen here. 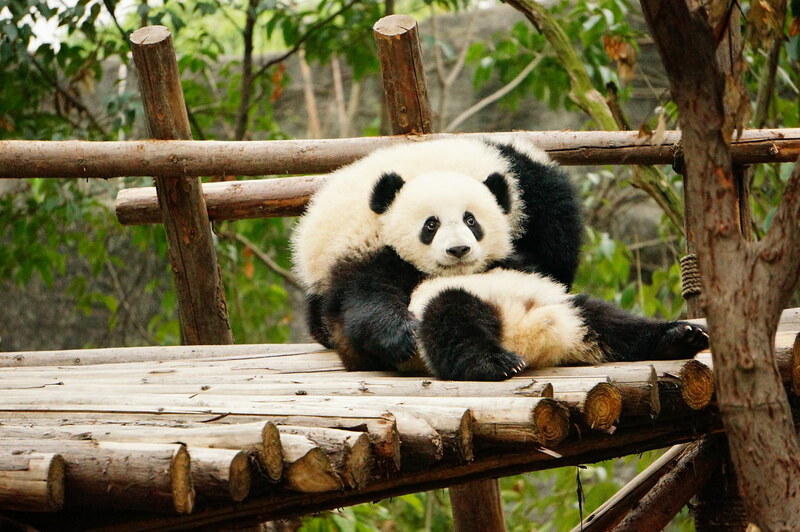 Posted from Chengdu, Sichuan, China.